SAN FRANCISCO (Reuters) -- As Volkswagen prepares to explain how it might fix the polluting diesel cars that set off the biggest scandal in the German automaker's history, whatever solution it proposes could be undermined by some owners in the United States who won't bring their cars in for a recall and can't be forced to. The cars, some 482,000 Passats, Golfs and Jettas sold in model years 2009 to 2015 in the United States, are peppy and fun to drive, owners say. Because fixing the cars is likely to result in lower performance and fuel economy, some drivers will decline, even though their cars would continue to spew 40 times the smog-producing emissions permitted by some states. If they do, there are few enforcement levers in place. In the three states with the most VW diesel cars caught up in the emissions scandal, only California withholds registration renewals from cars that fail to comply with recalls. 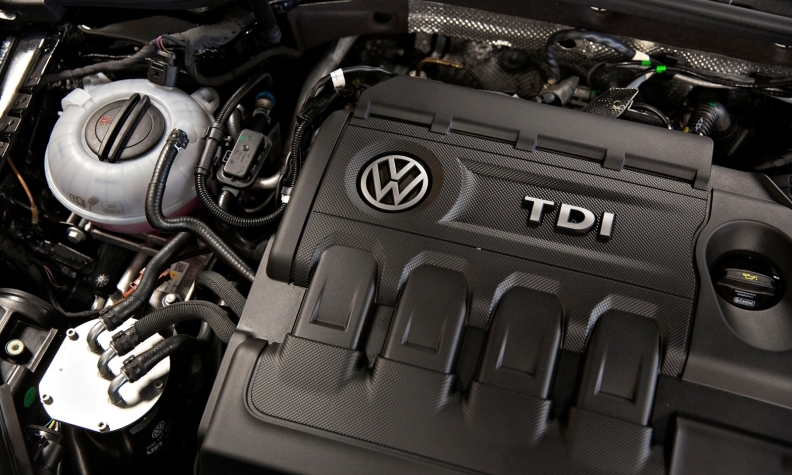 In Texas and Florida, which have the second- and third-highest number of VW diesels after California, there are no emission standards in place for diesel vehicles. Nationally, only 17 states are required by the Clean Air Act to confirm that owners of cars subjected to a recall show proof they have complied with it before they are allowed to take an emissions test required to register their cars, the EPA said. The EPA couldn't confirm whether the 33 other states don't require owners to prove they have complied with a recall. Texas doesn't include diesel vehicles in its emission inspection program and Florida no longer has a vehicle emission inspection program, EPA said. It isn't known how many other states don't require vehicles to pass emissions tests. The EPA has said a recall is likely. "I love the car," said the owner of a diesel Passat in Florida named Thomas, who didn't want to give his last name because of privacy concerns. "However, a lot of that is based upon the performance of the car. I am very dismayed that I am now in the position of ignoring the recall to have the performance of the car versus having the recall performed and the car not performing like the one I purchased." Jared Allen, a spokesman with the National Automobile Dealers Association, said loopholes in states such as Florida are why the nationwide recall completion rate hovers around 70 percent. "There is no enforcement mechanism that is tied to the consumer's ability to continue driving the vehicle," Allen said. One VW car owner on the VWVortex website said that the automaker would have to wave "a big carrot" in front of their customers to get them to comply with the recall. That could come in the form of loyalty programs, trade-ins, or cash incentives. VW late last week informed dealers it would offer "loyalty bonuses" of $2,000 for owners who want to trade in their cars. Thomas from Florida said he doubted that would be enough: "I think the hit we'll take in resale will be much greater than that." The EPA has the authority to order VW to recall the vehicles, but its authority to compel consumers to get their cars repaired is limited. Asked about enforcement levers, the EPA said a recall wouldn't necessarily require owners to repair their vehicle. Manufacturers have to submit quarterly reports summarizing response rates to the agency, the EPA said. But the stakes of disobeying a recall are clear: "Without the repairs, vehicles may be emitting harmful pollutants in excess of the federal emission standards," the EPA said in a statement to Reuters. In a recall, California officials deny re-registrations to owners who fail to bring their vehicles into compliance. Vehicles are registered yearly so owners could get away without a fix for up to a year without being caught. "I'd most likely wait as long as possible and let others be the technology pathfinders and get my cars 'fixed' only when there was a hard deadline by California after other folks get all the bugs worked out," said owner David Rosing of Los Angeles. A majority of states, however, including Texas and Florida, have no such laws, frustrating environmentalists. "I'm a bit surprised if Texas and Florida don't do the same thing (as California) and the EPA doesn't enforce that," said Roland Hwang, director of the National Resource Defense Council's energy and transportation program. One thing that could affect the recall response rate is that problem is emissions-related and not a safety issue. Even in safety recalls, many vehicle owners don't take cars back to dealers to get them repaired, as they are not forced to. According to the Alliance of Automobile Manufacturers, which is currently researching recall response rates, in 99 percent of safety recalls from 2000 to 2013, the National Highway Traffic Safety Administration did not issue an unconditional "do not drive" recommendation. That means that without VW's prodding its customers or wooing them with financial incentives, regulators can do little but hope that owners will comply. "Regulators should be giving the orders and calling the shots," said Kristen Monsell, an attorney with the Center for Biological Diversity. "Instead, VW seems to be in the driver's seat."